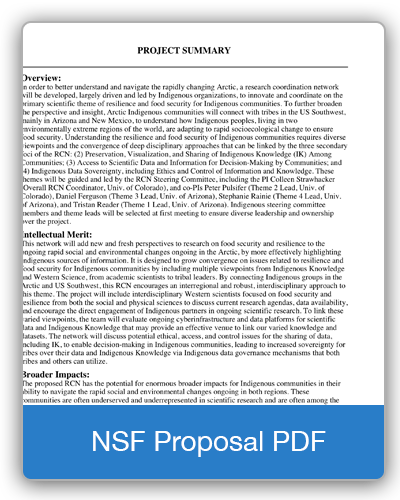 The Indigenous Foods Knowledges Network (IFKN) was initiated under a four-year National Science Foundation “research coordination network” grant (“Networking Indigenous Arctic and U.S. Southwest Communities on Knowledge Co-Production in Data Sciences"). The four-year award is under the direction of a research team at the University of Colorado and the University of Arizona. The goal of IFKN is to develop a network comprised of Indigenous leaders, community practitioners, and scholars (both Indigenous and non-Indigenous) who are focused on research and community capacity related to food sovereignty and Indigenous Knowledge. The network seeks to build connections among Indigenous communities in the Arctic and the US Southwest. Indigenous Peoples in these two regions share common challenges around sustaining, revitalizing, and adapting food and knowledge practices in the context of environmental and social change. Network members collectively work to improve understanding of these topics by promoting and carrying out research and hands-on activities that embrace and respect Indigenous Knowledge systems and support Indigenous communities. The research team from the two universities invited Indigenous leaders, community members, and scholars to join a steering committee to guide the project and build the network. The network comes together for in-person meetings once or twice a year and shares resources and information through this website and our listserv. The Indigenous Foods Knowledges Network was initiated under a National Science Foundation grant of $499,006 awarded under the Office of Polar Programs (award number 1745499).